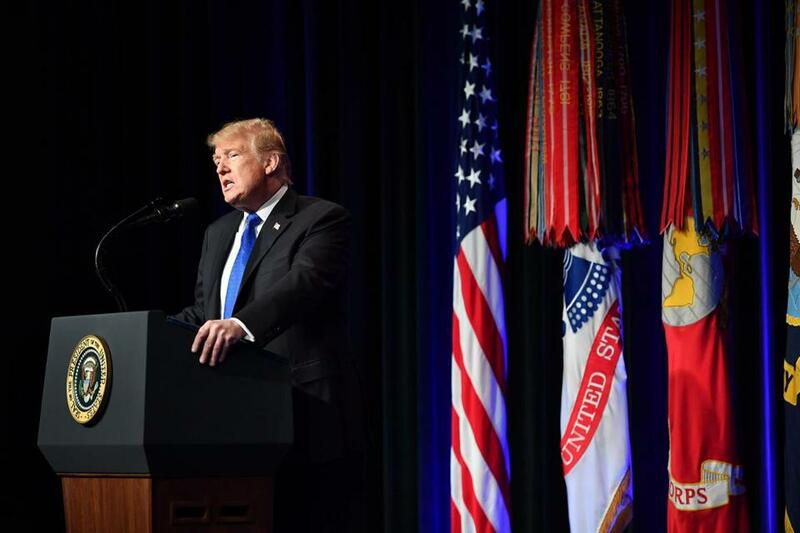 President Donald Trump spoke during the Missile Defense Review announcement at the Pentagon in Washington, DC on January 17, 2019. WASHINGTON — President Trump called on Thursday for an update of the United States’ missile defense system that he said would protect the United States from emerging threats — adopting a Cold War stance while also promoting futuristic ambitions with his much-touted Space Force. Announcing the results of a missile defense review at the Pentagon, Trump said the strategy would help deter hostile states — including Iran, which he said “is a much different country” now than when he took office. “Our goal is simple: to ensure that we can detect and destroy any missile launched against the United States anywhere, any time, any place,” Trump said. The strategy was originally planned for release last year, but was delayed. The changes mark the first update to the policy since a 2010 review by the Obama administration. Trump also offered condolences to the families of four Americans killed in Syria a day earlier and lashed out at Democrats in Congress for refusing to fund a wall on the border with Mexico — the central issue that has prompted the government shutdown, now in its fourth week. Last fall, Trump ordered the Pentagon to deploy US troops to the southwest border to help prevent migrants from illegally entering the United States. There are 5,900 US troops stationed at the border supporting the Border Patrol and other Homeland Security staff because they are legally prohibited from law enforcement duties within the country. Their mission is scheduled to last through September. The missile defenses expansion would make new investments in technologies, with a goal of countering strides in nuclear arms and missiles in Iran, North Korea, Russia, and China and other potentially hostile states. The gargantuan effort to shield the nation from missile strikes is often said to start in 1983 with President Ronald Reagan’s “Star Wars” program. Over the decades, the United States has spent more than $300 billion on the anti-missile goal, according to Stephen I. Schwartz, a military cost expert. The program is costly because the technical aim is so difficult. Warheads fired by intercontinental missiles zip along at more than 4 miles a second. The military, notwithstanding much effort, has found it extraordinarily difficult to destroy the speeding targets. The nation’s anti-missile corps relies on a relatively simple approach that uses ground-based interceptors. They race skyward and release speeding projectiles meant to destroy incoming warheads by force of impact — what experts call hitting a bullet with a bullet. The method has demonstrated fair performance against short-range threats, which move relatively slowly. In 2004, the Bush administration began deploying a bullet-on-bullet system in Alaska and California to defend against North Korean warheads. Since then, the system has undergone 10 costly flight tests against mock warheads. Five of the tests failed, giving it an overall success rate of 50 percent. The most recent test, in May 2017, successfully smashed the mock target to smithereens. Russia has emerged as perhaps the greatest threat as it develops a range of next-generation missile systems. In 2014, Washington formally accused Moscow of breaching an arms treaty by developing and deploying a prohibited weapon. Although Russia has consistently denied any violation, the Trump administration told Moscow in October that it is leaving the landmark treaty. The riddle behind the developments is how to find the most secure balance for the nation between arms-control treaties and antimissile weapons. The Trump administration is moving rapidly to put new emphasis on unilateral defense. Trump’s visit to the Pentagon landed at an awkward moment. His request for more money for missiles also comes in the midst of the longest government shutdown in history, as 800,000 federal workers have not been paid in almost four weeks — and the president has no immediate plans to end the political standoff with Democrats on Capitol Hill. Trump’s appearance at the Pentagon was also his first since Jim Mattis, the defense secretary, resigned from the administration in a rebuke of the president’s decision on Syria. Mattis’ departure sent shock waves across the globe and through his department. Trump has yet to nominate a permanent replacement. Patrick M. Shanahan, the former deputy defense secretary, is serving in the role on an acting basis.